Sun hats for women can help you not only in styling but also with sun protection. These head accessories provide a barrier against the summer heat while adding character to your getup. 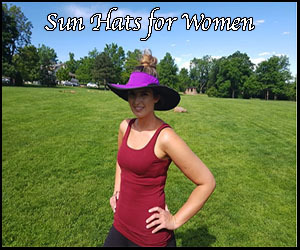 At Shape Flexer, we have created sun hats for women that combine elegance with functionality. If you want to protect your face from harmful UV rays and be extra stylish, you can't go wrong with one of the Shape Flexer sun hats for women. What Makes Our Sun Protective Hats for Women Different? Our sun hats for women can give your outfit a stylish edge. Some items in your travel kit are for styling, while others are utilitarian in nature. Our sun protective hats for women can be both. A marriage of style and versatility, our sun hats for women can add character to your travel outfit. You can appear extra cooler in pictures and rock that "traveling or adventurer girl" look while wearing one of the Shape Flexer sun hats for women. Our sun hats for women have a hidden back cape. For your maximum convenience, we have designed our sun hats for women to have a hidden back cape. You can use this cape to protect your nape whenever needed. Because the cape of our sun hats for women is deployable, you can easily tuck it back into its pocket when not in use. This feature of our sun hats for women helps prevent your nape from being roasted when traveling in the tropics. Our sun hats for women provide secret storage. You can make an on-the-go shelf out of the cape pocket of our sun hats for women. Using this secret storage of our sun hats for women, you can keep your cards, tickets, money, and other valuables in a secure place. Our sun hats for women have a detachable crown. A feature that makes our sun hats for women stand out is the zip-off crown, which is designed to give you extra ventilation. If you want to keep your head from getting sweaty, you can zip off the top of one of our sun hats for women and let the wind in. The zip-off crown of our sun protective hats for women helps the wearers give their hair some place to go. Gone are the days you have to fit all your locks into your hat, only to find your hair so messy once you take off your headgear. Our sun hats for women are machine washable. When we were designing the Shape Flexer sun hats for women, we wanted something that can retain its shape despite all the crushing and washing. That's why we have created our sun hats for women to be sturdy enough not to buckle during machine washing. The wearers of our sun hats for women can simply pop this headgear in a laundry machine and let the equipment do the cleaning. Whether you wash our sun hats for women on a warm or cold cycle is up to you. Our sun hats for women have a flexible brim. With a patented and durable wire built into their brim, our sun hats for women offer unparalleled adjustability features. You can bend and fold the brim of our sun hats for women to your desired shape, depending on your needs. For instance, you can bend the back of the hat for clearance while playing sports or carrying a pack. Are you scouring the market for the perfect sun protective headgear? Beat the heat while being stylish through the Shape Flexer sun hat! These products come in four awesome colors. Get yours today! To learn more about the history of our sun hat, get in touch with us.